Living by Faith: I'm gonna let it shine! Lets talk about running..then.. When I was younger and I would go for a "run" it usually consisted of starting out real strong and slowing to a walk until a car was coming or I was passing a house I knew just might have a guy I knew in it, that happened to be walking by the window and glance outside just in time to see my freshly lotioned toned calves go striding by with the grace of a gazelle and the perfect speed for perky breasts to have 2 good bounces before I completely passed the window. If I had only know then what I know now, I would have been totally naked yelling "enjoy it while it lasts, this fantastic bod will be going into hibernation in just a few short years". Lets talk about running.. now.. well I am working on it. I can feel myself becoming stronger from my working out and at this point I am not so afraid of the track. Part of this process has been becoming aware of my short falls. I really do think I can do these things. My mind says "sure, I can do a cartwheel" but as soon as my head darts to the side, hands shoot in the air, my arm fat quivers and settles in front of my face shielding my line of sight. As if that were not enough of a clue I have no business attempting such a feat I thrust in a down and forward motion, at this point there is a combination of crackling and flapping. Only the loud slapping sound (from breast or thighs, I still don't know) wakes me mid cart to the realization, that just maybe there are a few limitations to what I think I can do and what I am actually capable of. So my work out group committed to completing a 5k. At the thought I flashed to the not so cart-wheel. I feared this was another thing I thought I could do, but would fail. 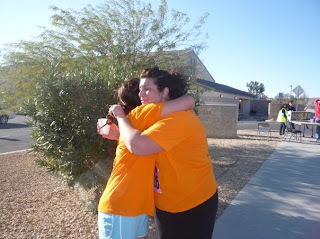 My workout leader encouraged me to walk the route before race day and she even walked with me! I finished in a little over an hour and felt more confidant. Well race day soon arrived. 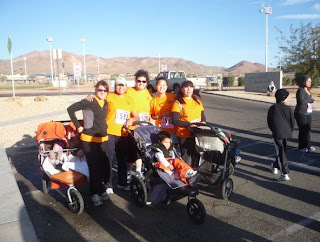 It was in Nov and for me was appropriately called the Turkey Trot. I committed to finishing the race even if I had to walk/run/crawl. It was so cold outside that morning my ears were killing me. With the shot of a blank, we were off and running, well some of them were. The first part is uphill and my plan was to walk that and get it over with. Many folks went sailing by. Only the 2 kids on bikes with training wheels bothered me. At the top of the hill my ipod decided to call it quits. Taking my mind off what my body was doing I tried to remember all the cadence my husband used to sing in the wee hours soothing our babies back to sleep. This was not successful. So I settled into a stride and began to pray. Talking to God is a past time of mine. I ignored the cold taking over my limbs and picked up my stride to warm from the inside out. My heart pounded, my arms pumped and one at a time, one foot in front of the other I jogged. The Lord spoke to me that moment. I teared up listening to what was put in my heart. I was running... not for research, or a cure, or someone that I had lost or was going to lose. I was running for me... for health, for strength, and confidence. 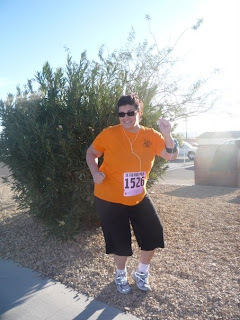 I was running because I have been blessed with a body that can! I was running because I wanted to do this for myself! At that point I began to sing the only song I could think of all the words to "this little light of mine, i'm gonna let it shine" "wont let satan (pant) it out, i'm gonna let it shine"! I came around the bend and the finish line was in sight. I saw my friends running and cheering me forward! Then I heard "YOU HAVE NOT EVEN REACHED 50:00 MINUTES YET...RUUUUN!!!!" I freaked out and dug deep, running as hard as my tired feet would carry me! I came in at 44:53!! Never in my wildest dreams would I have guessed to get such a great time! I was overwhelmed and burst into tears! My friends cheered and held me tight! I DID IT, I DID IT!!!! So I don't have anymore weight lost, but I have gained so much in confidence! Thanks to my fellow Turkey Trotters! You always amaze me!! I am so proud of you!! AWESOME!!! I am so proud of you! Wish I could have been there in person!! You are doing fantastic - keep up the good work! I'm sitting here reading with tears rolling down my face. You are inspiring! You are doing a great thing for your family and yourself. Congratulations! I can't even imagine what that must feel like. You're fantastic.